The proposed India-Nepal 5,040 MW Pancheshwar project aims to produce more power than all existing dams in the state. 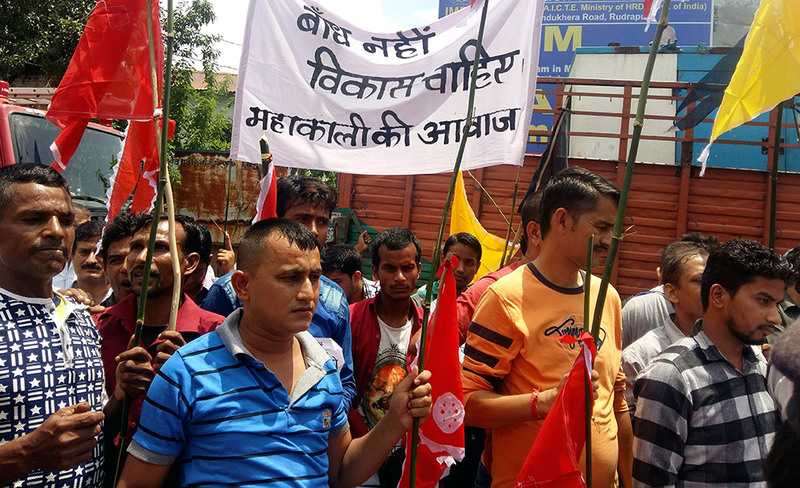 Slogans rent the air as around 1,000 people gathered outside Vikas Bhawan in the Pithoragarh district headquarters of Uttarakhand on August 11. 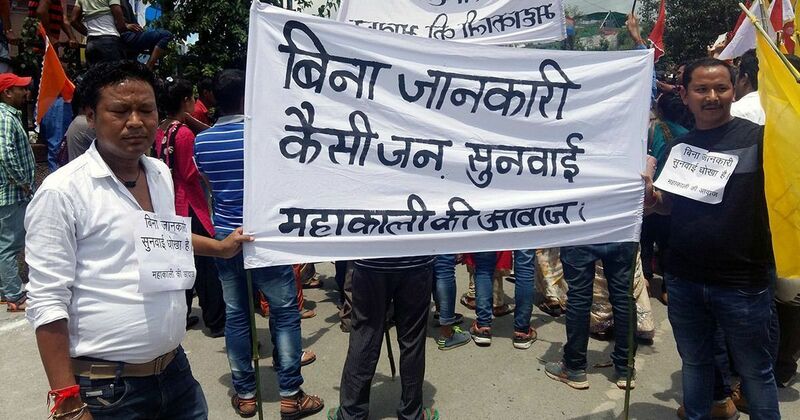 They held up banners that read “Bina jaankari kaise jansunwai” (what kind of a public hearing is this without informing us), “Baandh nahee vikas chahiye” (we need development, not a dam), and “Ye jansunwai dhokha hai” (this public hearing is fraud). The police held them back. 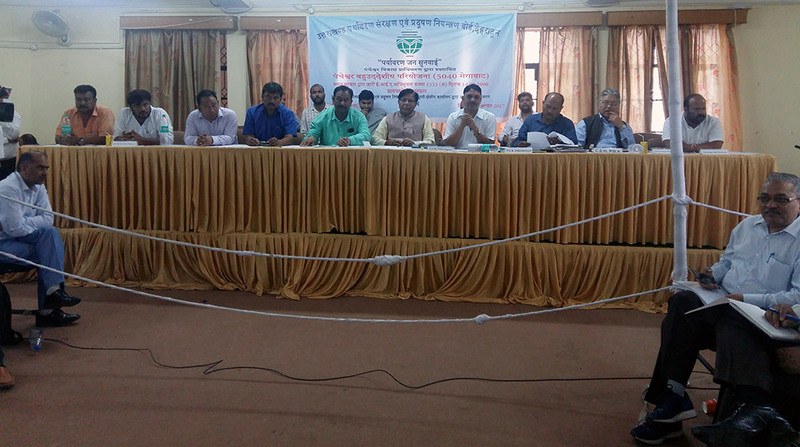 Inside, a public hearing on the environmental impact of the proposed 5,040-megawatt Pancheshwar hydropower dam – with the potential to produce more power than all existing dams in the state put together – was in progress. Under law, such hearings are to be conducted after an environment impact assessment report of the project has been prepared and put before the people who would be affected by the project in a language they can read. It is a consultative process. The district administration takes note of people opposed to or in favour of the project and any other concerns. Then they move on to the next public hearing. Finally, they send a report to the Central government. The first public hearing on the Pancheshwar dam was held in adjoining Champawat district on August 9. The third and final one was conducted in Almora on August 17. 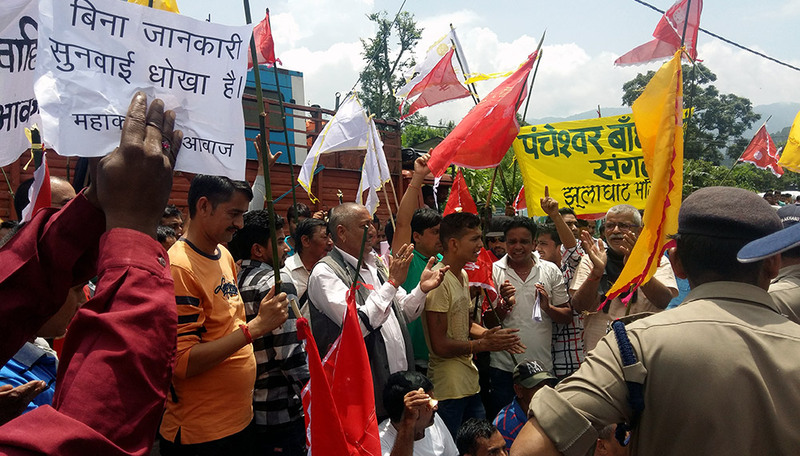 In Pithoragarh, there were angry voices inside Vikas Bhawan too. They questioned the logic of holding a public hearing in the upper Himalayas in peak monsoon, when the rains have cut off several villages and landslides have gobbled up entire roads. Days later, on August 14, two cloud bursts left eight people dead in Pithoragarh while 25 are still missing. The state government’s hurry may have something to do with the Centre’s sudden and favourable U-turn on the project. In 2016, an expert panel of the Union Environment and Forests Ministry had sought a joint mechanism with Nepal to assess the impact of the dam on both sides of the border. But in May this year, it relented and said such a move would delay the process, paving the way for the public hearings. 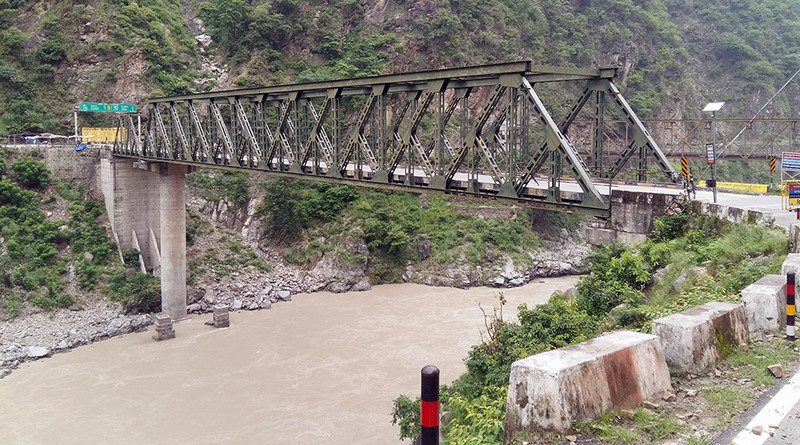 Pancheshwar is not just the biggest dam to be planned in Uttarakhand but also a commitment made by India to Nepal under the 1996 Mahakali Treaty. The long-pending project got a fillip when Prime Minister Narendra Modi visited Nepal in 2014. A Pancheshwar Development Authority was set up consequently to finalise the project. The project is to come up near the Pancheshwar temple, 2.5 km downstream of the confluence of the Mahakali and Sarju rivers. It entails two dams working in tandem. The main Pancheshwar dam would rise 311 metres and the second one downstream would be 81 metres high. The project is expected to submerge 11,600 hectares of mountain area – a land mass larger than Chandigarh (11,400 hectares) – in five seismic zones. Of this area, 7,600 hectares would lie in the three districts of Uttarakhand and the rest in Nepal. In all, the authorities plan to acquire 9,100 hectares of land in Uttarakhand and 5,000 hectares in Nepal. According to project developers, close to 30,000 families spread over 62 villages in Uttarakhand stand to lose their land. They have not yet assessed how many livelihoods would be impacted. At the public hearing in Pithoragarh, people expressed their anger and anxiety over the project. Some also objected to the presence of policemen and leaders of the ruling Bharatiya Janata Party on the dais. The regulations do not allow this. 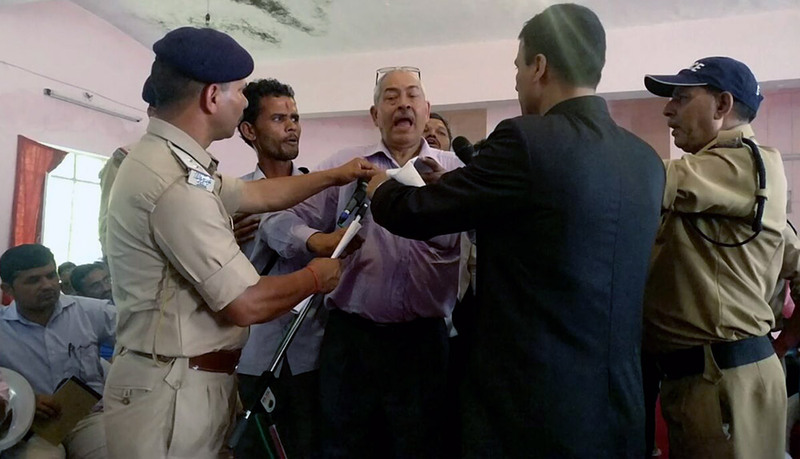 Harish Dhami, a Congress MLA, almost came to blows with BJP MLA Bishan Singh Chuphal and the two had to be pulled apart. But not everyone in the three districts is opposed to the dam. Some hope it will change the poverty, lack of employment and high migration rate in the region. It is also true that whether it is the BJP or the Congress, when in power, both actively promote the case for big dams in the hill state. 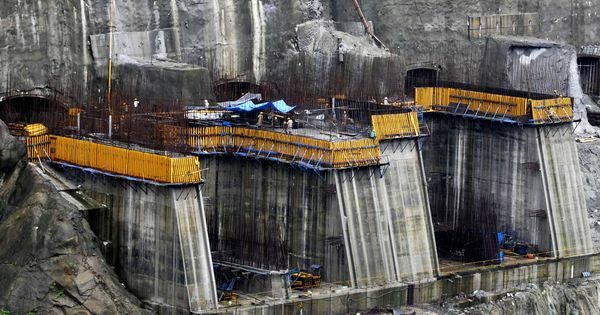 This despite a government expert panel’s conclusion that dams had exacerbated the devastation caused by the Kedarnath floods in 2013, in which over 5,000 people were reportedly killed. However, apprehension outweighed optimism at the hearing venue. Furthermore, the Pancheshwar dam is a threat to small projects for regional development. In Rasyuna village on the banks of the Sarju river, for instance, villagers have come together to plan their own 1-megawatt mini hydro project under the state’s policy to promote small dams. Their project report estimates that the village would earn Rs 16 lakhs to Rs 20 lakhs a month from such a dam and employ around 100 people. But now they have been told that the Pancheshwar dam will submerge the site. Even for those willing to consider the project, past experiences with resettlement and rehabilitation do not inspire much confidence. Experts acknowledged that rehabilitation would be a challenge. “Governments talk about relocating people but there is hardly any useful land left available in Uttarakhand,” said Shekhar Pathak, an academic who has researched the history of the western Himalayas for decades. Activists questioned the clearance process and the logic of holding public hearings during the monsoon. With the process of public hearings completed, the government is well on its way to appraising the project. The decision now lies with the Environment and Forests Ministry. Or does it? He is not the first prime minister to speak in favour of a project before it has been appraised for its environmental impact – a statutory requirement. Legally, the environment impact appraisal can lead to the rejection of a project too. But, that is just the law. Hridayesh Joshi is a senior journalist who works with NDTV and is currently researching climate change in the Himalayas.